The photograph Burst of Joy. From left to right, Lt Col Robert L. Stirm, Lorrie Stirm, Bo Stirm, Cindy Stirm, Loretta Stirm, and Roger Stirm. 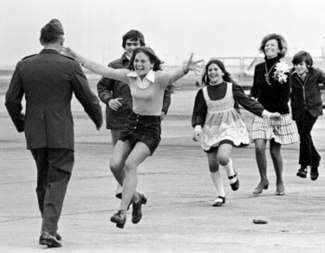 Burst of Joy is a Pulitzer Prize-winning photograph by Associated Press photographer Slava "Sal" Veder, taken on March 17, 1973 at Travis Air Force Base in California. The photograph came to symbolize the end of United States involvement in the Vietnam War, and the prevailing sentiment that military personnel and their families could begin a process of healing after enduring the horrors of war. The first group of POWs leaving the prison camps in North Vietnam left Hanoi on a U.S. Air Force Lockheed C-141 Starlifter strategic airlift aircraft nicknamed the Hanoi Taxi, which flew them to Clark Air Base in the Philippines for medical examinations. On March 17, the plane landed at Travis Air Force Base in California. Even though there were only 20 POWs of that first increment released aboard the plane, almost 400 family members turned up for the homecoming. Lt Col Robert L. Stirm, USAF made a speech, "on behalf of himself and other POW's who had arrived from Vietnam as part of Operation Homecoming." Smithsonian Magazine says that "Veder, who'd been standing in a crowded bullpen with dozens of other journalists, noticed the sprinting family and started taking pictures. 'You could feel the energy and the raw emotion in the air'." Veder then rushed to the makeshift photo developing station (for 35 mm film) in the ladies' room of the air base's flightline washrooms, while the photographers from United Press International were in the men's. Smithsonian Magazine says that "In less than half an hour, Veder and his AP colleague Walt Zeboski had developed six remarkable images of that singular moment. Veder's pick, which he instantly titled Burst of Joy, was sent out over the news-service wires". The photograph depicts United States Air Force Lt Col Robert L. Stirm being reunited with his family, after spending more than five years in captivity as a prisoner of war in North Vietnam. Stirm was shot down over Hanoi on October 27, 1967, while leading a flight of F-105s on a bombing mission, and was not released until March 14, 1973. The centerpiece of the photograph is Stirm's 15-year-old daughter Lorrie, who is excitedly greeting her father with outstretched arms, as the rest of the family approaches directly behind her. Despite outward appearances, the reunion was an unhappy one for Stirm. Three days before he arrived in the United States, the same day he was released from captivity, Stirm received a Dear John letter from his wife Loretta informing him that their marriage was over. Stirm later learned that Loretta had been with other men throughout his captivity, receiving marriage proposals from three of them. In 1974, the Stirms divorced and Loretta remarried, but Lt Col Stirm was still ordered by the courts to provide her with 43% of his military retirement pay once he retired from the Air Force. Stirm was later promoted to full Colonel and retired from the Air Force in 1977. After Burst of Joy was announced as the winner of the Pulitzer Prize, all of the family members depicted in the picture received copies. They all display it prominently in their homes, except the Stirm patriarch, who says he cannot bring himself to display the picture, given the betrayal he suffered from his wife on the home front. About the picture and its legacy, Lorrie Stirm Kitching once noted, "We have this very nice picture of a very happy moment, but every time I look at it, I remember the families that weren't reunited, and the ones that aren't being reunited today — many, many families — and I think, I'm one of the lucky ones." Donald Goldstein, a retired Air Force colonel and a co-author of a prominent Vietnam War photojournalism book, The Vietnam War: The Stories and The Photographs, says of Burst of Joy, "After years of fighting a war we couldn't win, a war that tore us apart, it was finally over, and the country could start healing." ^ U.S. Prisoners of War Return To Travis Air Force Base (Television production). March 17, 1974. Retrieved October 14, 2018. Butler, Carolyn Kleiner (2005). "Coming Home: To a war-weary nation, a U.S. POW's return from captivity in Vietnam in 1973 looked like the happiest of reunions". Smithsonian magazine. Retrieved March 17, 2012. Hunter, Jennifer (December 22, 2010). "Joy between the covers". Toronto Star. Retrieved March 17, 2012. Lucas, Dean (July 26, 2010). "Burst of Joy". Famous Pictures. Retrieved March 17, 2012.
pulitzer.org (2012). "1974 Winners". pulitzer.org. Retrieved March 17, 2012. This page was last edited on 20 April 2019, at 15:35 (UTC).